Microcontrollers are central elements in modern electronics as embedded computers. 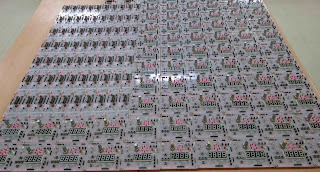 Most vendors offer many inexpensive evaluation platforms to showcase their microcontroller products. Typically such platforms (Arduino, MSP430 LaunchPad etc) fall short on the aspect of sensors and other digital I/O peripherals. 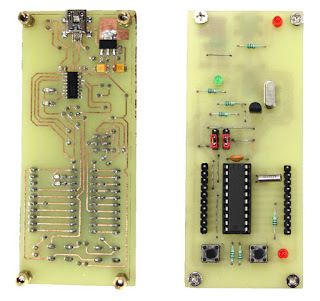 We set out to design a DIY-able sensors and peripherals board that anyone with access to simple PCB fabrication facilities, can recreate and further the task of learning about microcontroller programming and physical computing. While Arduino remains a popular microcontroller learning platform, MSP430 which is a popular, capable and formidable microcontroller from Texas Instruments lacks an inexpensive learning platform. TI's MSP430 Launchpad sells for about Rs. 1200 in India and can be prohibitive for some. To address the cost issue with an introductory MSP430 learning platform, we created the MSP430 LunchBox. MSP430 LunchBox is an inexpensive MSP430 learning platform that can be fabricated for personal use for under Rs. 100. 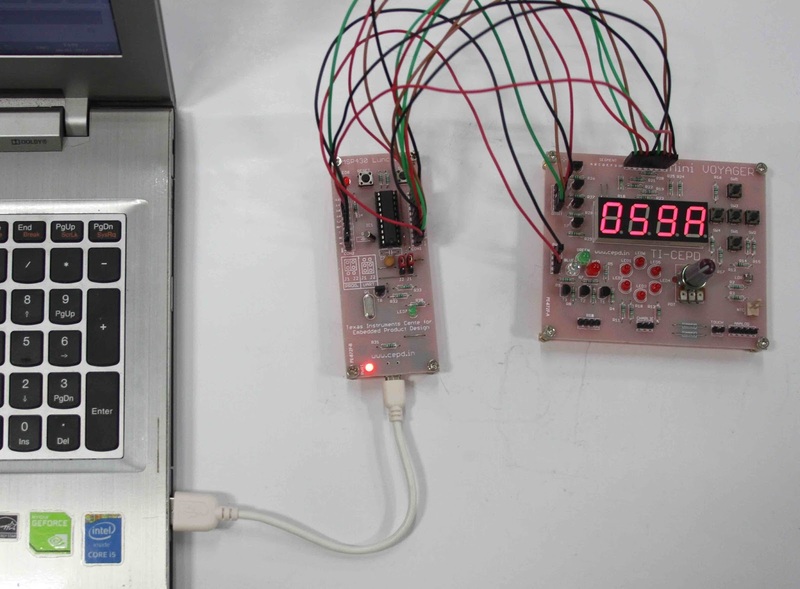 The LunchBox board supports any 14-pin or 20-pin DIP package MSP430 G series microcontroller, which a hobbyist can obtain for free through the TexasInstruments’ free samples programme. The entire bill of material for the board, excluding the microcontroller, is under Rs. 100. The PCB has been designed in a single sided, toner transfer friendly format, allowing enthusiasts to fabricate one, at little or no cost. The photograph below shows the early lab prototype of the LunchBox. 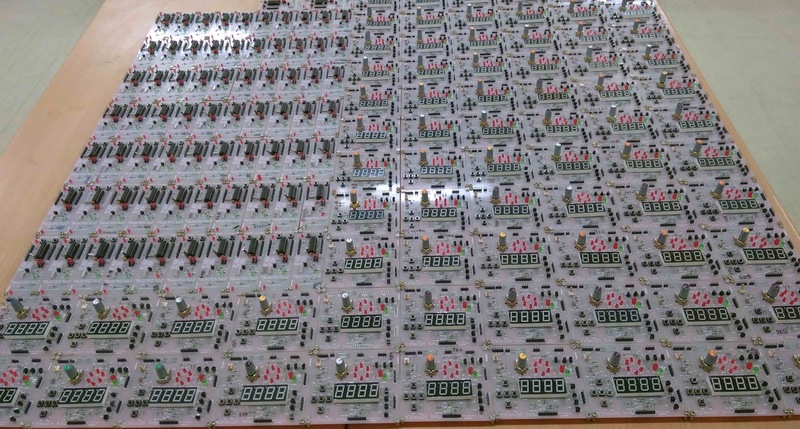 The PCB board files used to fabricate the lab version of the PCB as seen above can also be mass manufactured for a more professional experience. The photograph below shows such a professionally manufactured board. The table below lists the salient features of the LunchBox. Like the Arduino or the MSP430 Launchpad, the LunchBox too is devoid of any serious sensors or user peripherals. 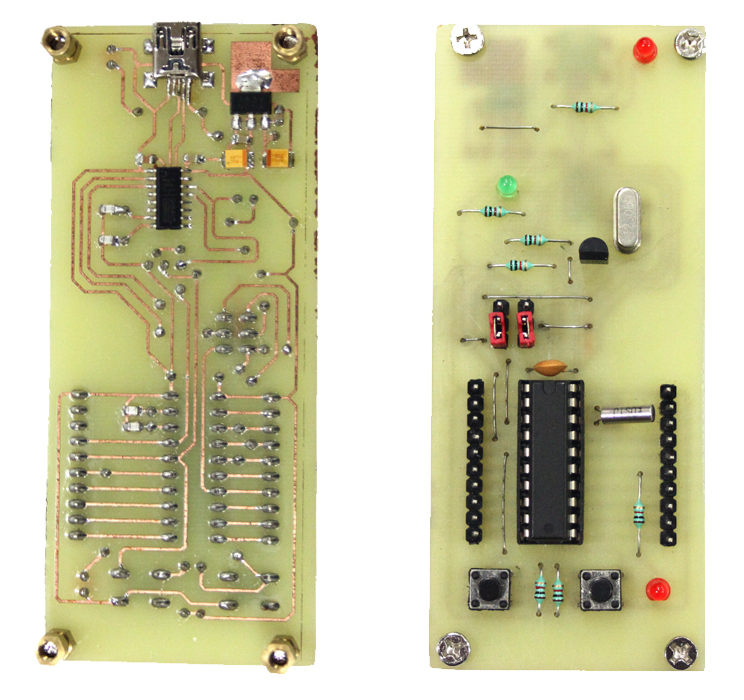 So, to enrich the learning experience, we developed two simple and inexpensive I/O expansion boards, the Mini-Voyager-1 and Mini-Voyager-2. As with the LunchBox, the Mini-Voyagers are also a single sided PCBs that can be fabricated at home or lab. The following tables list the salient features of both the Mini-Voyagers. The photograph below shows both the Mini-Voyagers in the company of the MSP430 LunchBox. To use the LunchBox together with Mini-Voyager-1 and/or Mini-Voyager-2 is as easy as 1-2-3. 1. Write code in IDE. 2. Connect the required peripherals from MV-1 or MV-2 to the LunchBox pins using male header pins provided on the board. 3. 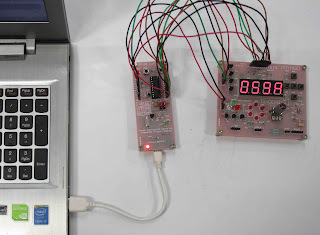 Connect the supply voltage of either 3.3 V or 5 V using male header pins provided on the LunchBox (other microcontroller platforms that work at 3.3V such as MSP430, MSP432, TIVA ARM as well as the BeagleBoneBlack can be used as easily. Microcontrollers that work at 5V can also be used with Mini-Voyagers.). 4. Power the LunchBox using a USB mini cable. 5. Upload the code. CODE → CONNECT → UPLOAD! The photograph below shows LunchBox and Mini-Voyager-1 in action. More than 50 experiments and small projects can be performed using this ecosystem. During a recent event, we had 10s of students solder, test and use the LunchBoxes and Mini-Voyager-1! I teach at the Netaji Subhas University of Technology in the Division of Electronics and Communication Engineering, currently as an Associate Professor. I direct two open access laboratories, namely Centre for Electronics Design and Technology (CEDT) and Texas Instruments Centre for Embedded Product Design (TI-CEPD). I am the author of several professional articles and six books. One of my books has been translated into Chinese and another one into Greek. My recent book “TinyAVR Microcontroller Projects for the Evil Genius”, published by McGraw Hill International consists of more than 30 hands-on projects and has been translated into Chinese and Russian. My latest book on TIVA ARM Cortex M4 microcontrollers published by Springer is just hot off the press! I am a licensed radio amateur with a call sign VU2NOX and I hope to design and build an amateur radio satellite in the near future. In Support of the Venerable 8085!